Despite the recent flooding, we as a community remain strong. Maxtec is dedicated to rebuilding the homes of our neighbors. We can offer advice on the best course of action to take for your home if you experienced flood damage, and we will work with you to rebuild your home better than it was before the storm. Maxtec has been the go-to choice for countless homes in Acadiana for more than a decade. Our certified professionals are equipped with the essential tools and knowledge you're looking for, and our courteous staff is committed to making your Maxtec experience incredibly easy and completely satisfactory. Here at Maxtec, we have more than a decade of experience hanging drywall. We've perfected the method and take an efficient approach that is done timely, effectively, and correctly. For conventional wall insulation, we proudly install EcoBatt, an environmentally friendly, thermally efficient & sustainable insulator. Your drywall finish will be a major component of your home so don't take a gamble on inexperienced vendors offering an alarmingly low price; trust our licensed, insured staff to get the job done right at an affordable cost. Our comprehensive insulation solutions can make a significant difference on your monthly energy bills and your home's overall level of comfort. Trust Maxtec to deliver the best services for your home's insulation. Prevent fire, smoke and toxic gases from passing through pipes, cables and other openings. The seamless blanket of insulation that comes with net & pump wall insulation custom-fits cavities of all shapes and sizes. The complete coverage guarantees maximum efficiency throughout the entire cavity and controls air infiltration. 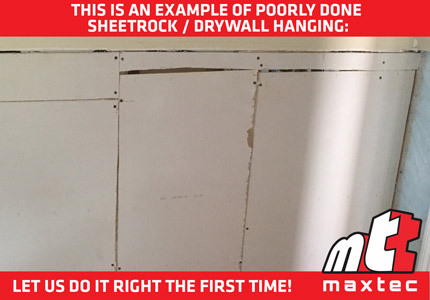 Maxtec® will hang your drywall correctly, quickly and professionally. It takes an experienced team of installers working together to ensure that all of the screws are set to the proper depth and that as few cuts in the sheet rock are made. Let the professionals at Maxtec hang your drywall the proper way so you don't end up with a job like this. Drywall finishing is an in-depth process that requires skill to be done well. Your drywall finish will be a major aesthetic component of the inside of your home, and a poorly done drywall finish can look like a disaster. Don’t take a gamble on inexperienced vendors offering an alarmingly low price; trust our licensed, insured staff to get the job done right at an affordable cost. We can’t stress enough how important it is to work with a credible, licensed, insured professional when working on home construction projects. With more than 15 years of experience, there’s nothing we can’t handle. Let’s build it together. Experience our commitment to you. Work with Maxtec today to make it happen. © 2016 Maxtec. All Rights Reserved.